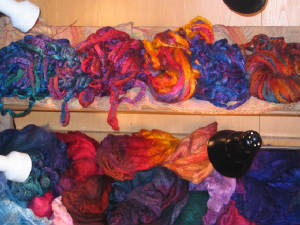 Beautiful 50% cultivated silk/50% fine wool fiber in sumptuous colors for spinning, felting, papermaking, or any other creative project you have in mind. Just a few of our luscious colors on display - $10.00 per ounce plus postage.. Also available are 100% silk caps for $10.00 per cap plus postage. Email me at carolyn@goodshepherdyarn.com to find out what's in stock and how to order.